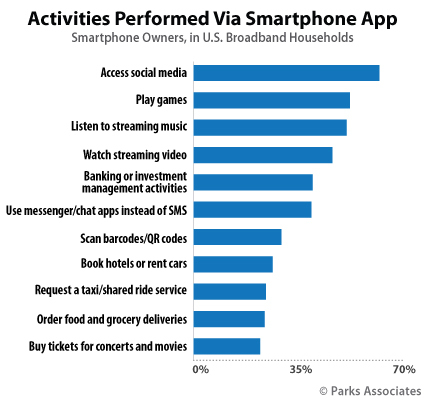 Research from Parks Associates shows that nearly 50% of smartphone owners in US broadband households, stream video on their phone, creating more demand for high-speed mobile connections and the coming shift to 5G. Social media is still the most popular activity, with nearly 60% of smartphone owners using their mobile phone for social media access, followed by playing games and streaming music. About one quarter of US broadband households with mobile service now consume more than 10GB of mobile data per month. More than 45% of the heads of US broadband households use personal assistant applications. The resurgence of unlimited data plans has been successful in getting consumers to upgrade their service. Mobile service providers differentiate their unlimited data plans by their data speeds, quality of streaming, and value-added services, arranging them in packages that are attractive to consumers. As the race to 5G heats up, network capabilities will also become increasingly important in the battle for consumers. Kristen Hanich, research analyst, Parks Associates.